Sometimes you have an odd collection of vegetables and leftovers in the fridge. 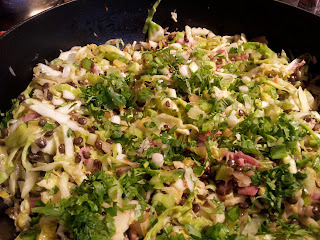 This week I had a small swede, some pumpkin, a large parsnip, a leek, some leftover corned beef and mustard sauce. 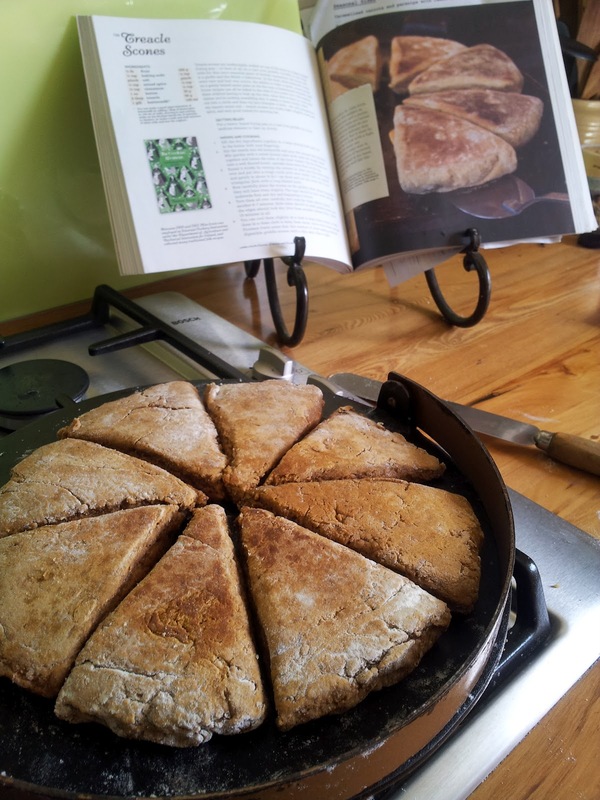 I knew Lois Daish would have ideas for this odd collection in her "Good Food" cookbook, and she did. Cut the rind off the pumpkin or butternut and remove the seeds or peel the kumara - cut into 2 cm dice. 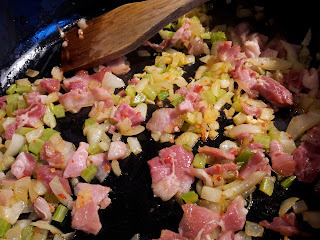 Barely cover with water and simmer until tender - about 20 minutes. Sprinkle with chopped fresh parsley or your chosen herb - coriander would be good. 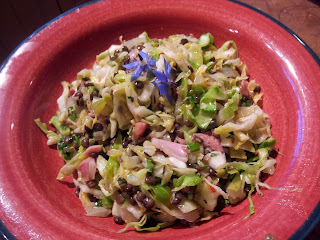 Here's another recipe from Lois Daish that I adapted to use my leftover diced corned beef. 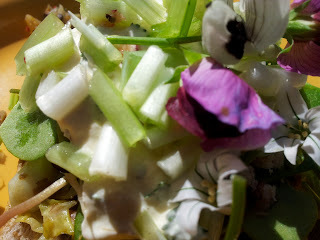 I usually keep faithful to this recipe because its delicious as is, but it also works with additions. 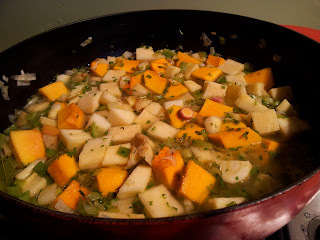 * I used the freshly squeezed potato liquid as part of the water measure in the Aromatic vegetable stew. It's too good to throw away. No use keeping it as stock unless you cook it because it quickly turns black but you could drink it as it has health benefits. You should rinse out your tea towel immediately to avoid staining. Instant pickled onion: a decorate and tasty addition to a salad or a topping to a dish like the aromatic vegetable stew. It's great in a simple cheese and pickled onion sandwich. 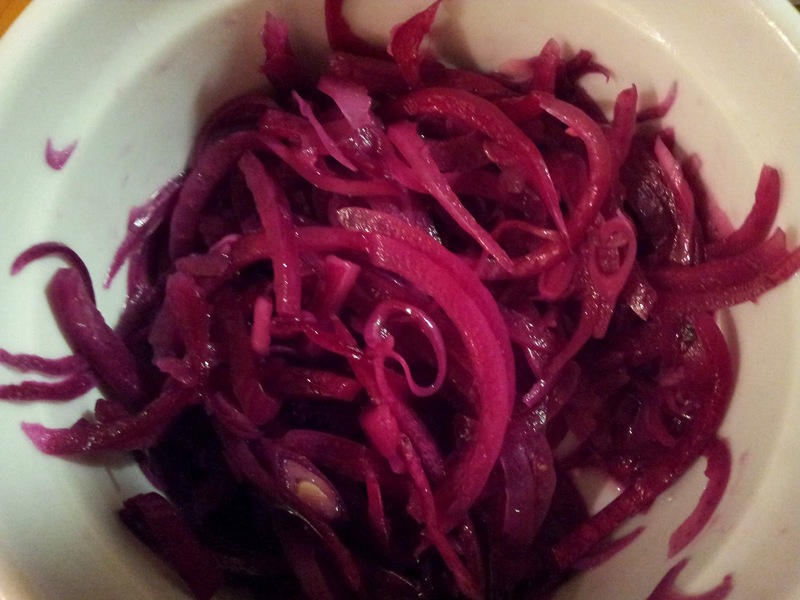 Slice onion (red, brown or Spanish white) very finely using a mandolin (if you have one). Sprinkle on some sugar, salt and then a sprinkling of cider or wine vinegar to taste. It takes a minute for the onion to soften and be pickled - sweet and milder than raw. Keeps for a day or two in the fridge. 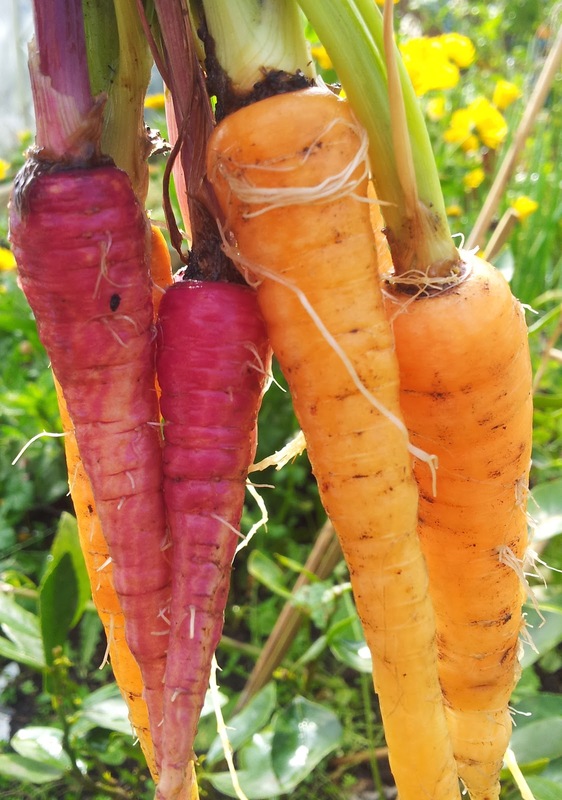 There is nothing quite like pulling a carrot straight from the garden, running it under the tap and eating the crunchy sweetness straight away. But is it healthier to eat a carrot raw or cooked? I was surprised at the answer. 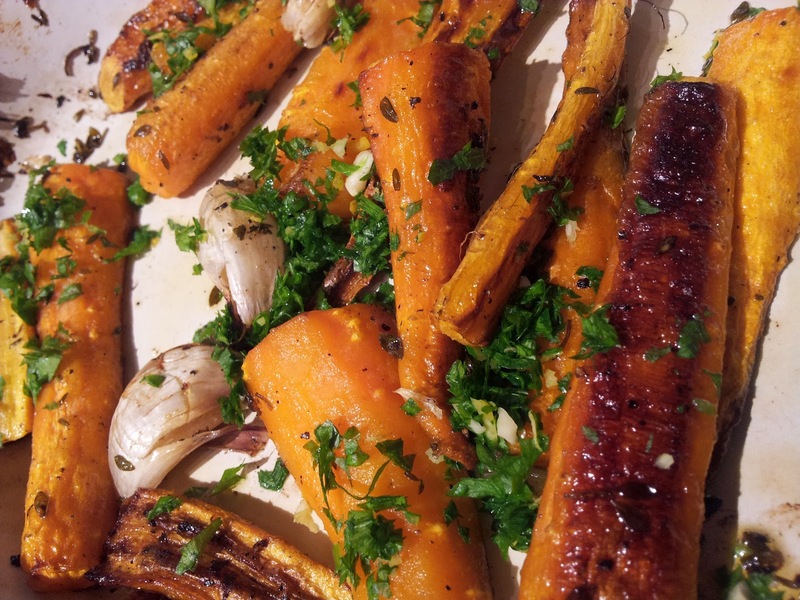 Carrots are more nutritious when cooked. 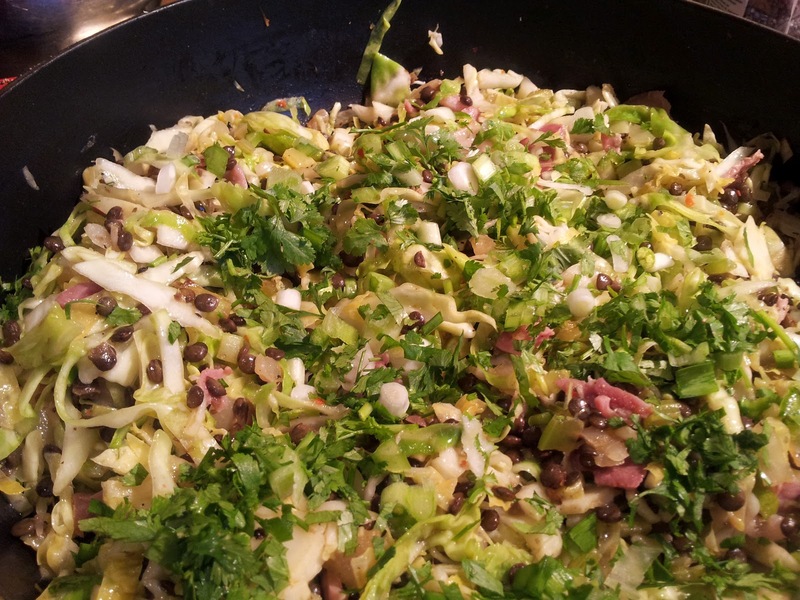 That childhood favourite of bubble and squeak (parsnip and carrot mash) is the healthiest of all if you add olive oil. Don't stop eating them raw - you do benefit from the vitamin C in carrots that is lost in cooking. This is good news for me because I love carrots cooked in the oven and Farmers Market chef Alison Lambert gave me an excellent way of cooking them. 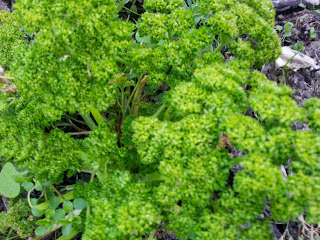 I have a request for that recipe to go with the gremolata topping I gave in the parsley posting. 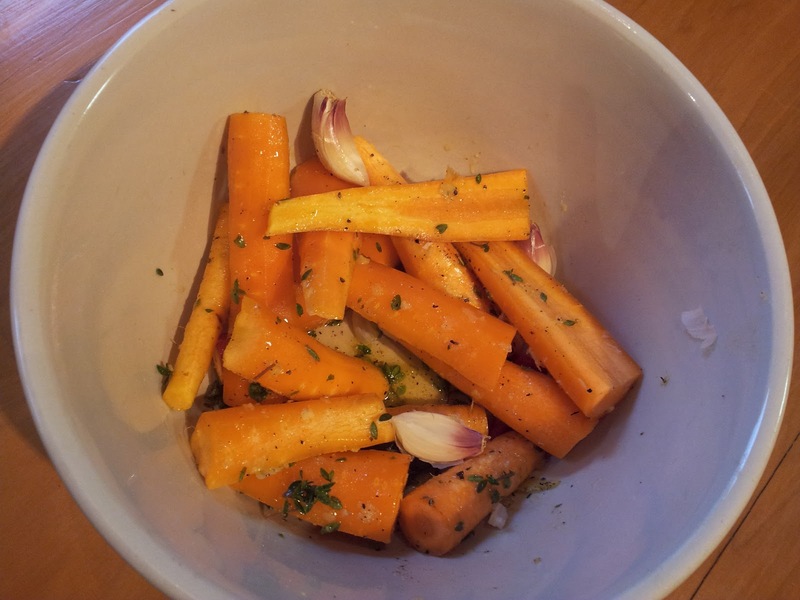 Place your roasting dish into the oven to heat up so that when you add the carrots they immediately roast and colour up. 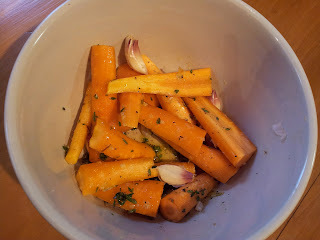 Put carrots, thyme, and garlic into bowl with oil, butter and season. Toss and combine so that the carrots are coated in oil. Remove foil and continue to roast for a further 20 minutes or until tender and golden. 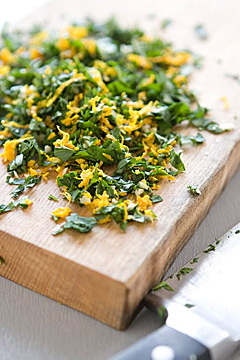 Toss through or sprinkle on top the gremolata and serve immediately - you need to do this last minute so that when the vegetables are placed on the table they have that fresh fragrance of the parsley and lemon zest. You can also mix in some mint with the parsley which would work really well for some vegetables, e.g courgettes and asparagus. * Good to know: Carrots cooked without being sliced have one quarter more of the anti-cancer compound falcarinol than those that are chopped up first. So limit the cutting up as much as you can until after they are cooked. I saw on a television programme that it doesn't take any longer to cook a carrot whole than to cook it sliced. 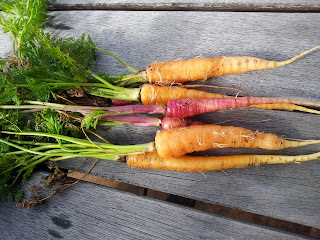 Purple carrots are not just a trendy addition to your carrot options. 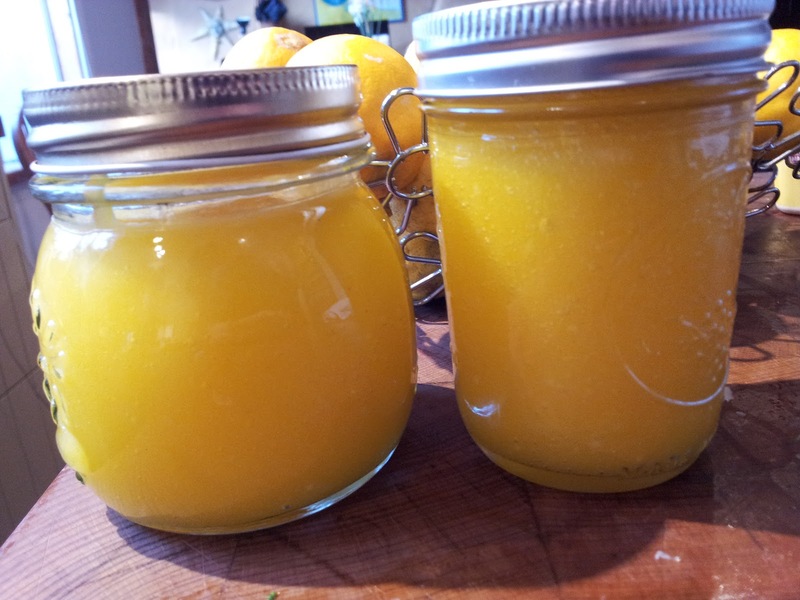 They tend to have greater quantities of anti-oxidants and vitamins than the orange variety. 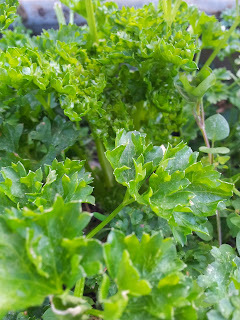 The more intense the colour, the higher beta-carotene content the vegetable or fruit has and this includes greens like kale, silverbeet and broccoli. I have purchased six orange cauliflowers called Cheddar Cheese so I imagine these contain beta-carotene. My family used to joke that my son Francis was raised on raw carrots like a rabbit. He was my only fussy eater but he would eat raw carrots. Perhaps Francis knew a thing or two because carrots are so good for you. Carrots help your eyesight, hair and nails, regulate blood sugar, lower blood pressure, improve your ability to fight infection, assist in fighting liver and heart disease and for breast feeding mothers can enhance the quality of breast milk - so why wouldn't you eat lots of them! But there is a warning that you can overdose on vitamin A especially if you are consuming lots of carrot juice. People have turned up in doctors surgeries looking quite orange with vitamin A poisoning. My favourite juice combination is carrot, apple and ginger and is a great tonic to take if you are fighting infection or feel your body is under stress - and it tastes so good! 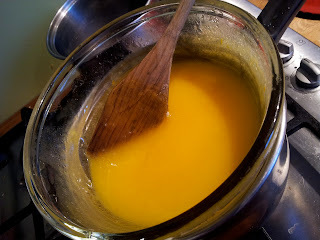 Jamie Oliver first introduced me to baking carrots and I often do carrots this way or mix with some other vegetables. He uses thyme but I often use marjoram - you can use either or try tarragon as it's delicious with carrots. Jamie Oliver does this all in a large piece of foil. I tend to use a covered casserole dish. He mixes everything together on the foil (like I did in the bowl in the previous recipe), brings the sides up and then add the wine and scrunch the foil together to seal. He cooks this for 45 minutes at 220C or longer for older bigger carrots. I tend to cook them for 50 minutes at 180C fanbake in the casserole dish. But it can fit in with whatever else is in the oven temperature wise - just the cooking time will vary. 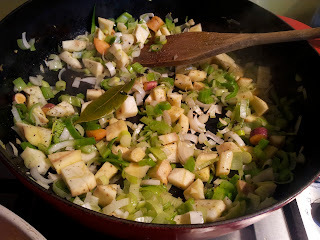 I often cook potatoes and other vegetables this same way with some squashed garlic to make a one pot vegie meal for the two of us. New potatoes are especially delicious. The foil method is handy to use if you haven't got much room in your oven as it can be shaped to fit, or if you are somewhere where there are not enough oven dishes. 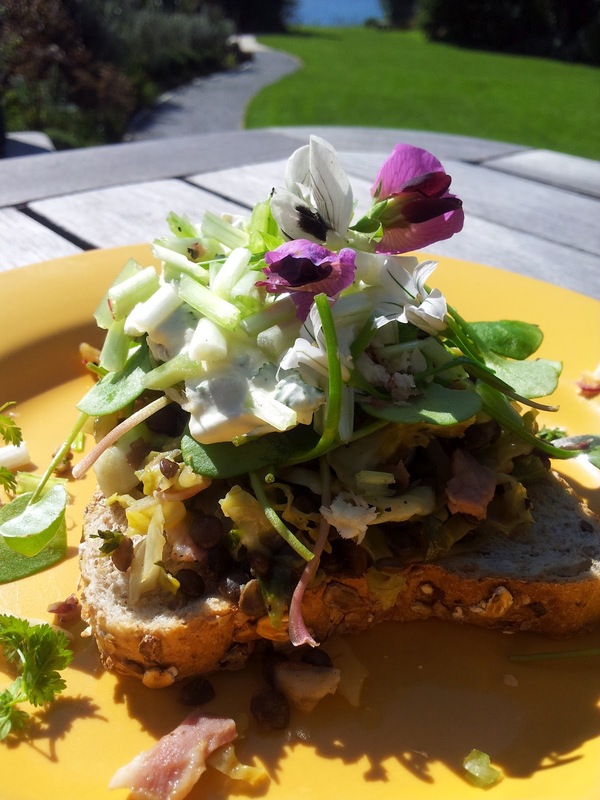 It's great to present for an outside meal as it looks rustic and casually thrown together...which is it. 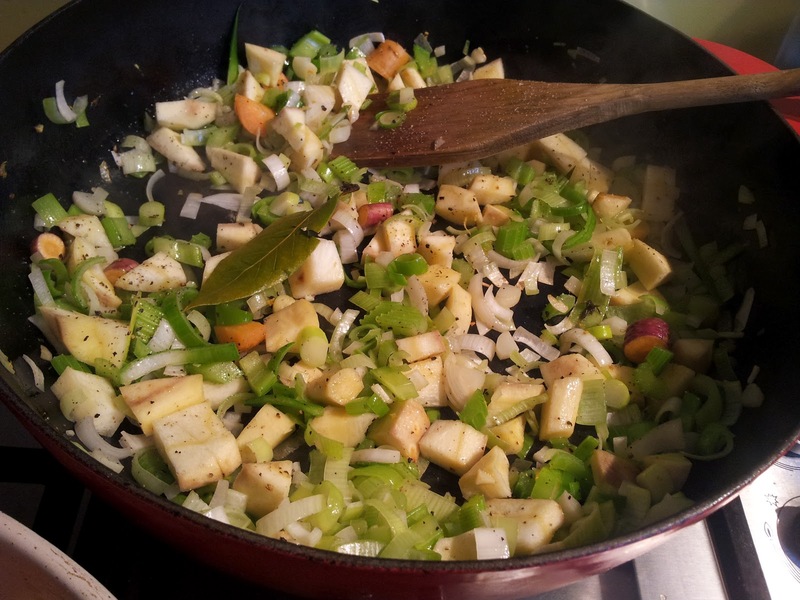 * Its important that your ground spices are fresh so that the oils and fragrance remain. 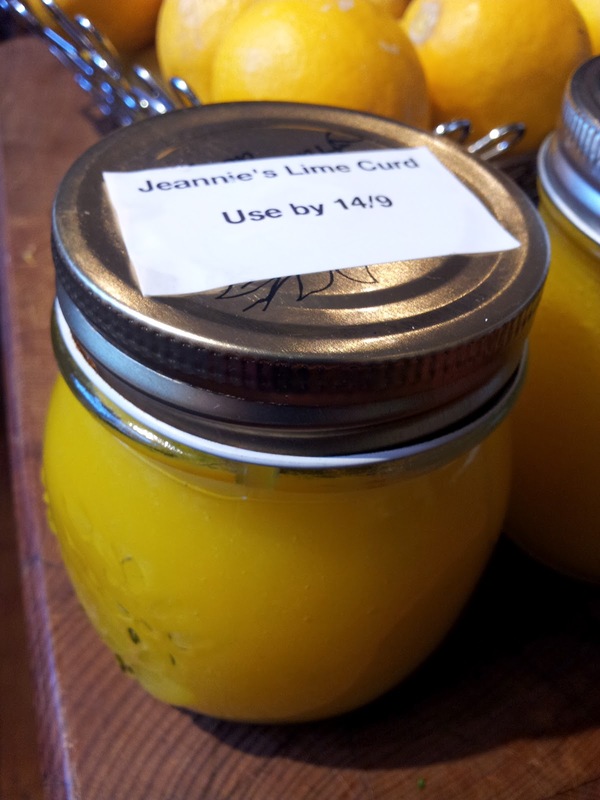 You don't need to buy ground cumin you just need cumin seeds. Put them into a small heavy pan on the stove top and toast until you can smell the fragrance - it will only take about ten seconds. Now put the seeds into a spice grinder (a coffee grinder you keep for the purpose) or grind with a mortar and pestle. Now smell the difference between the ground cumin you buy and the one you have prepared. I didnt know you could eat carrot tops. I won't will be eating my aged carrot tops for vitamin K but I will try some baby carrot tops when they arrive. 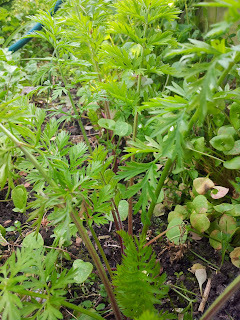 I need to plant some carrots soon so that I can enjoy lots of carrots over the summer. 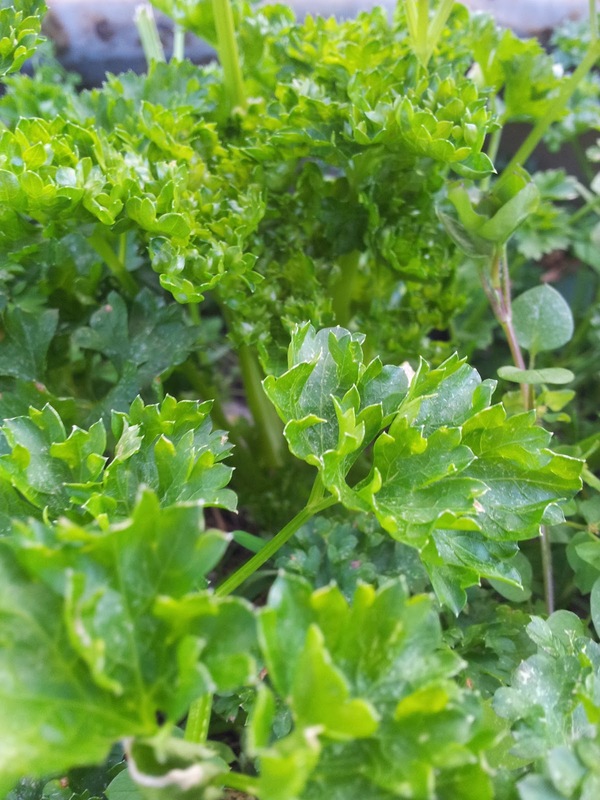 I do prefer to get my vitamin K from parsley (see my previous post on parsley). 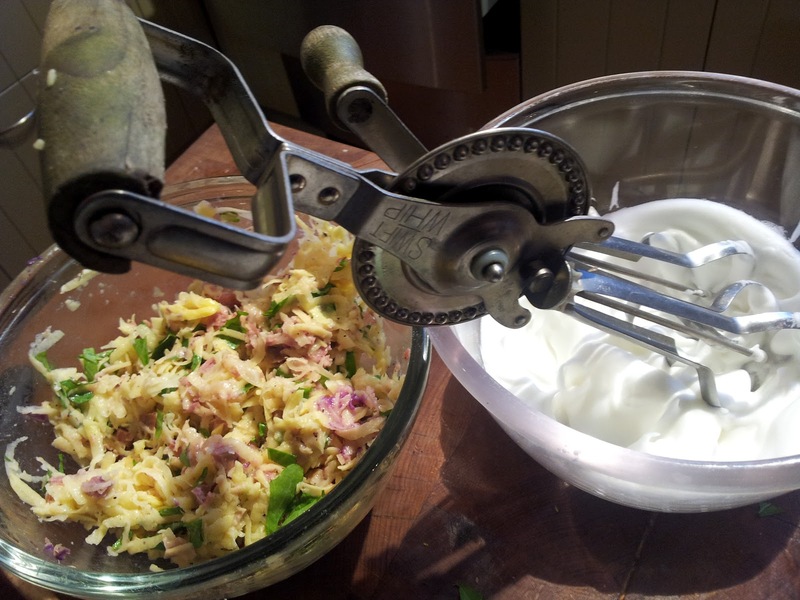 There has been some debate with neighbours Rob and Clare about just what to call this piece of cooking equipment. 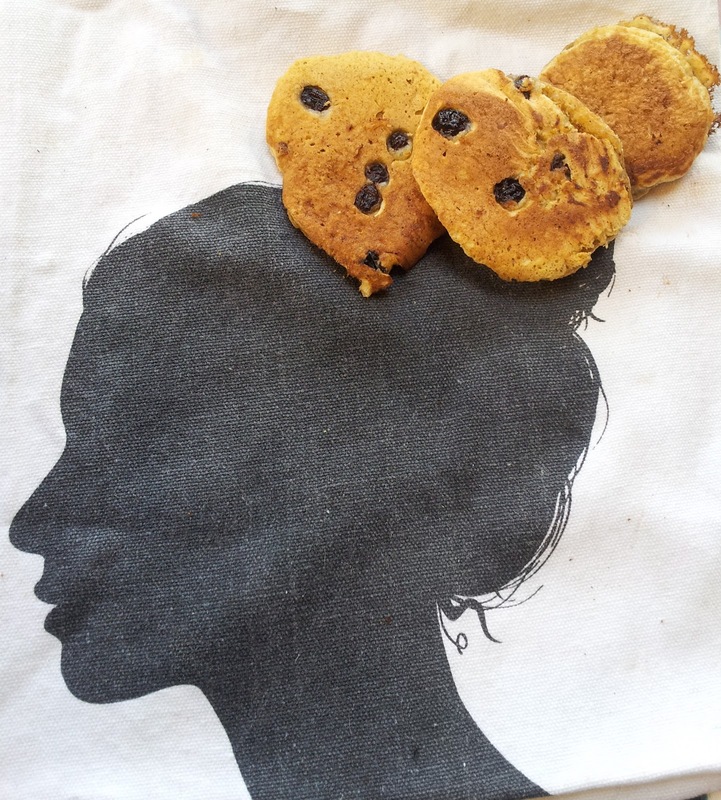 Alexa Johnson's recipe book "Ladies a Plate - Traditional Home Baking" gave us the answer. Well three answers really! The Scots call it a girdle, the Irish a griddle and the Welsh a bakestone. "These metal plates were once an essential piece of kitchen equipment in the days when domestic ovens were rare and fuel was scarce." I will call mine a girdle from now on to reflect my Scottish heritage. 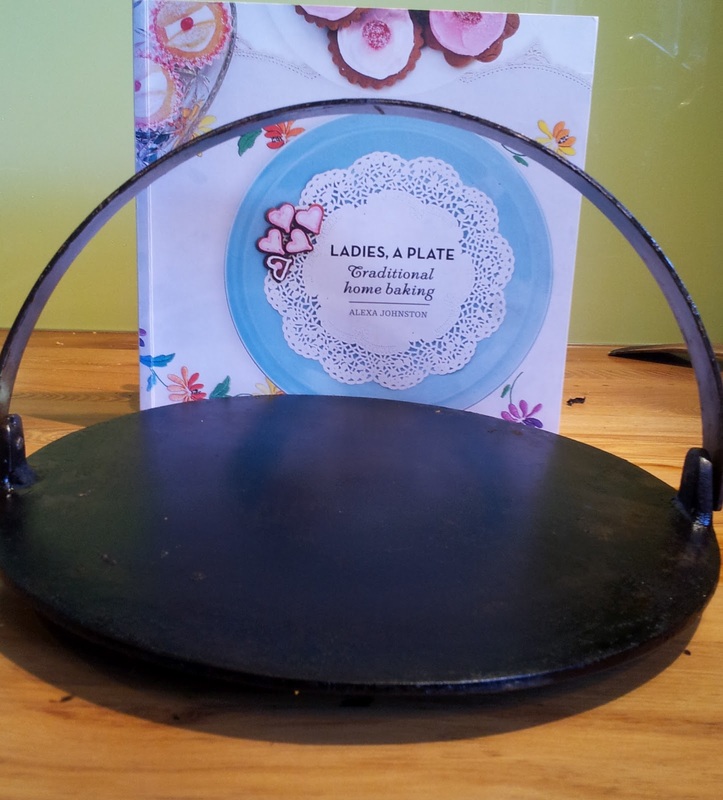 Clare and Rob hunted down their own girdle or griddle in a second hand shop in South Dunedin. Clare proudly handed to us while we were in the garden a plate of Welsh tea cakes - they were delicious! You can use a heavy, preferably caste iron, pan instead of the girdle to make any of the following recipes. 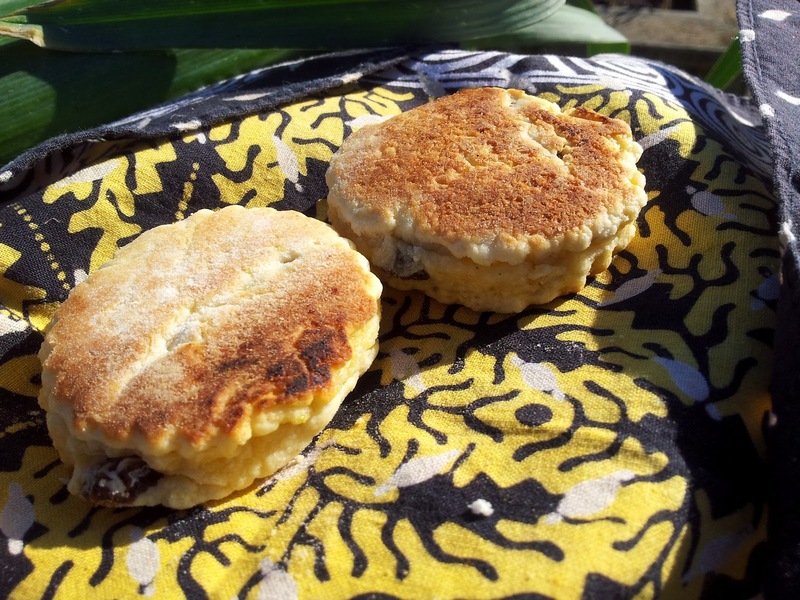 Welsh tea cakes are a cross between a pikelet and a girdle scone. 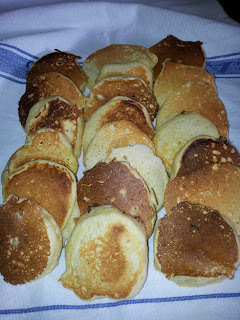 They look and taste similar to a dense pikelet with a sugary topping but the preparation is more like a scone. The cakes freeze well so you can choose to make the full recipe and freeze half or just make half the recipe. The Welsh cakes Clare gave us were still warm and that's the best way to have them. 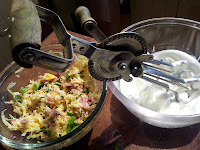 Rub butter into flour (to save time I use my stick blender to do this), add currants and beaten eggs to make a stiff dough - adding a dash of milk if the dough is too dry. Working with a 1/4 of the dough at a time, roll out on a lightly floured board to 7mm thick and use cutter of around 5cm width to make dough circles. 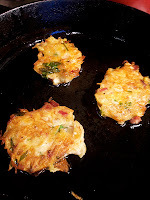 Cook 3-4 minutes on each side on a very gentle heat as would be on a coal or wood range top (not easily accomplished on a gas stove top). They will puff up as they cook. 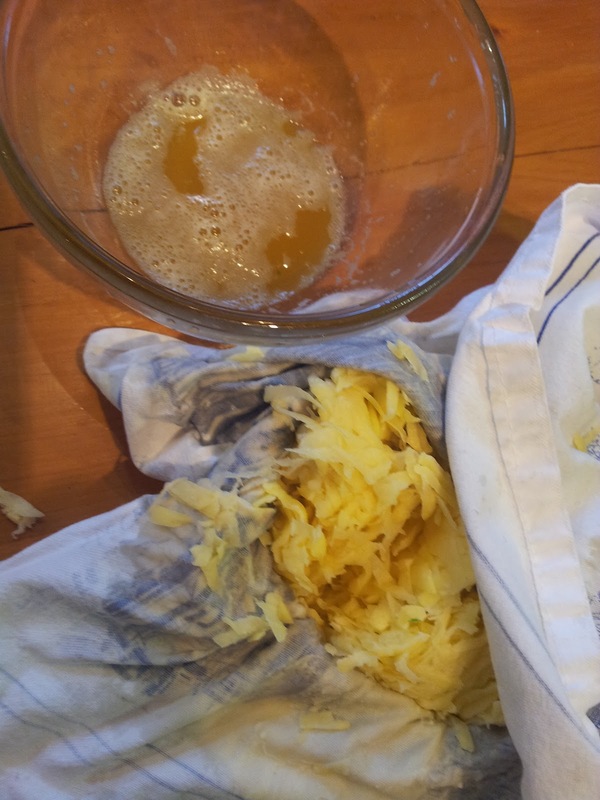 Store in a folded tea towel and sprinkle with caster sugar as they come off the girdle. 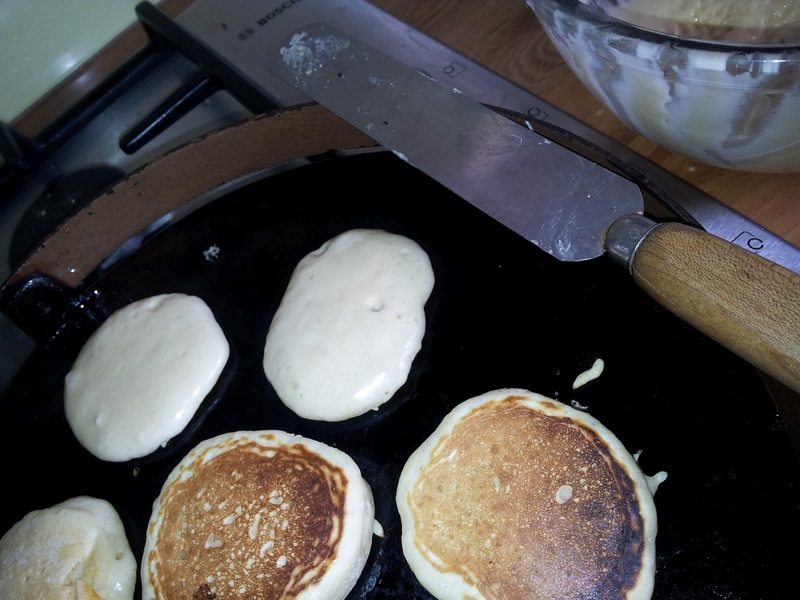 In my earlier post I gave you Nan's Pikelet recipe and yesterday with my sister coming for a coffee I decided the adapt the original recipe as suggested in Hugh Fearnley-Whittingstall's "Everyday" cookbook (one of my favourite recipe books). 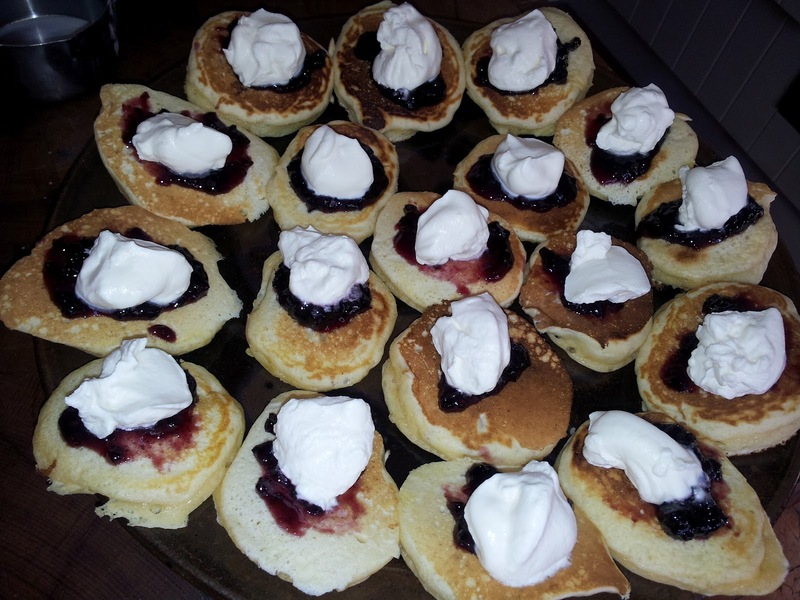 He calls his pikelets, Drop Scones. I decided to make Nan's pikelets with 50% white flour and 50% stoneground wholemeal flour to make them a healthier choice and added grated lemon zest to give them a little zing. 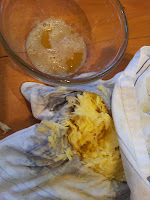 Alternatively add 1 tsp of ground ginger instead of the lemon zest. Hugh suggested adding sultanas onto the pikelet once cooking on the gridle. I decided that I would like to try currants. You can even make a smiley face with the currants or sultanas for the kids. We loved the currants and while the pikelets weren't as fluffy as the 100% white flour ones, you felt satisfied eating less - which is a good thing. "With a piece of buttered treacle bread in his hand a man may well feel like a god." 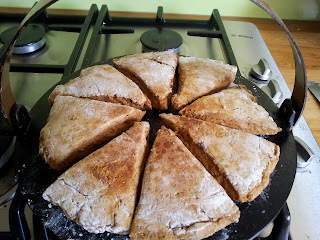 Treacle scones are crusty, light, slightly sweet and spicy and an excellent morning tea on a Sunday morning with friends. Put the Girdle on to heat slowly. Sift the dry ingredients and either rub in butter with your fingers or do this step in a food processor if you need to save time. 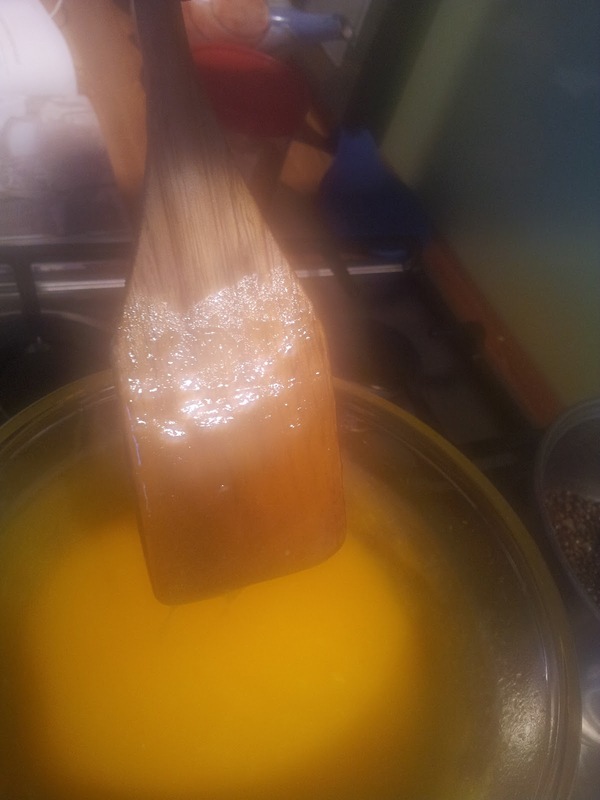 Mix the treacle and buttermilk together and with a rounded knife gently and quickly until the dough comes together and leaves the sides of the bowl cleanly. Tip mix out onto floured surface, and sprinkle more flour on top. Knead ever so briefly to make a rough circle . Rollout gently to just over 1 cm thick and cut into 6 or 8 farls. Place the scones on the girdle - do not oil the girdle. The girdle should have been slowly heating up while you were preparing the scones. 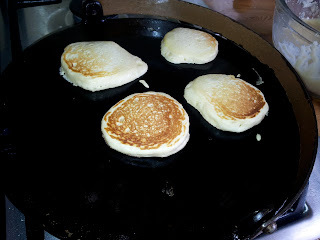 I have found that I need to put my gas at the very lowest point and using a simmer plate if you have one could help to distribute the heat evenly, avoiding burning the outside while leaving the inside uncooked. The secret to a thin skin on the girdle scone is to cook slowly - 6-7 minutes each side and then a couple more minutes both sides until the edges look dry - around 15 minutes in total. Both sides should be a dark golden brown. 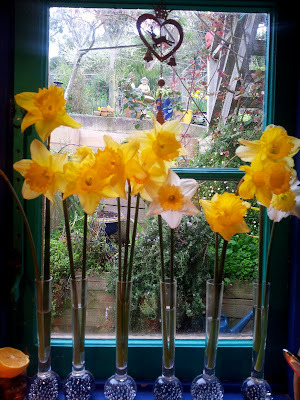 To keep them crusty you can cool them on a wire rack, or if you want to keep them warm and soft wrap them in a tea towel. *You can make your own buttermilk by adding 1 Tbsp lemon juice in 150 ml of full cream milk stirring it on the kitchen bench for 10 minutes to thicken. Or make half and half mix of skim milk and and low fat yoghurt. They certainly went down a treat today with our visitors. We enjoyed them buttered and with plum jam. You now have three choices of recipe to try some stove top baking. Enjoy and let me know how you get on. 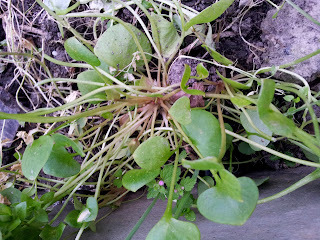 I thought I should tell you more about Miners Lettuce - its one of the first spring salad greens I use. 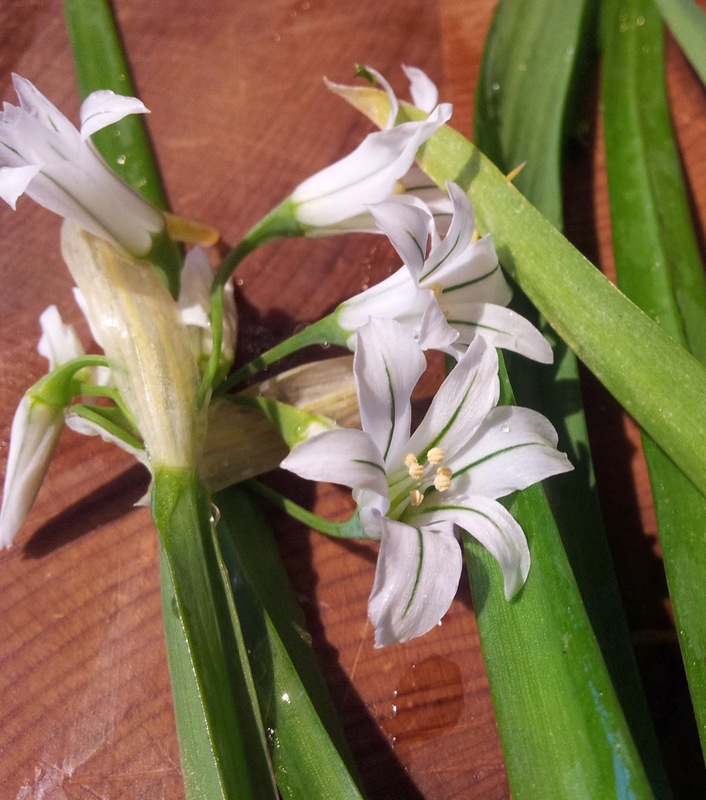 It pops up in the garden in the winter and once you have one of these plants you will always have it as it self sows really well. 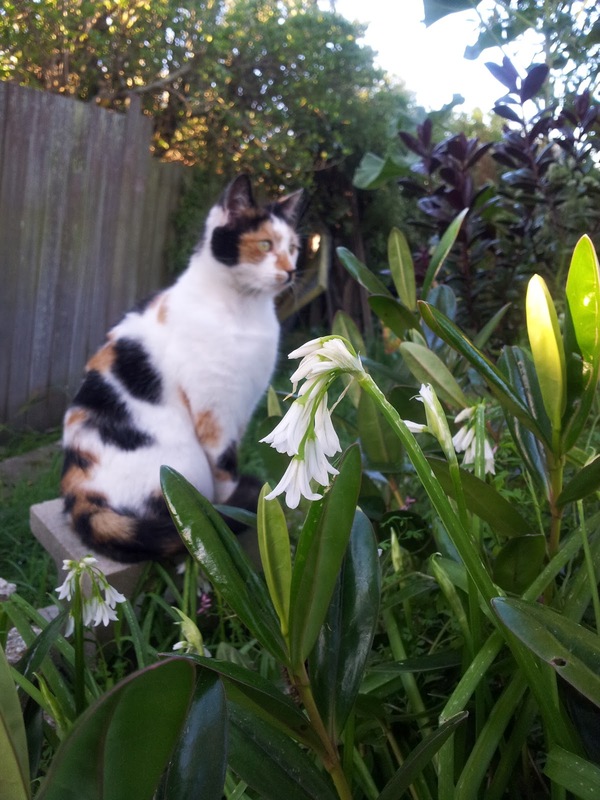 I tend to make a cull and use whole plants if they are going to be in the way of what I have planned to plant. They start in a small rosette but can grow up to 25 stems and by just cutting off some of the stems it will continue to grow. It does take time to cut and prepare but its worth it. 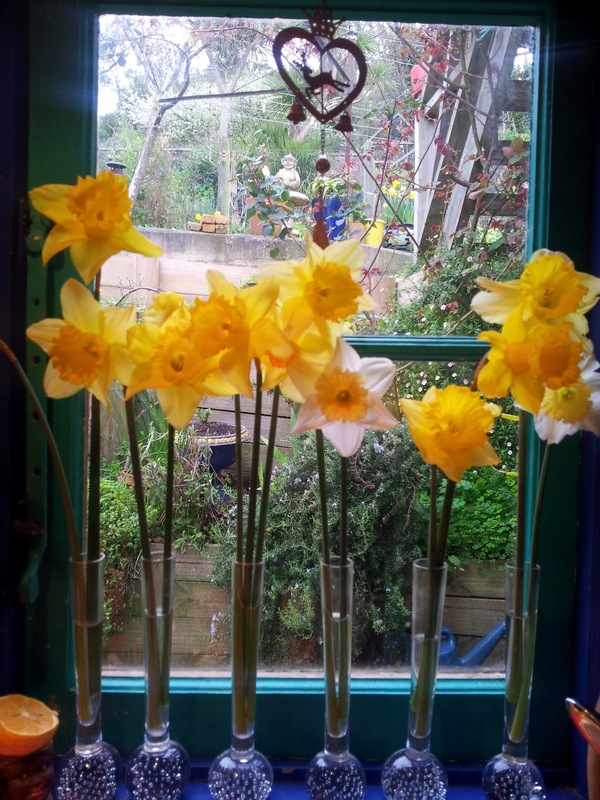 They can still be used once they are flowering and they look attractive in flower. 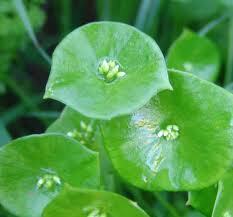 Miners lettuce seeds can be purchased through Koanga seeds - $3.80 and can shared with friends. 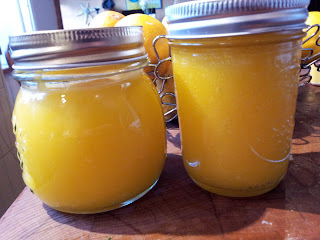 It originates in western US and was reputed to have come to NZ via the gold miners from California as they knew the high vitamin C content would allow them to avoid scurvy. 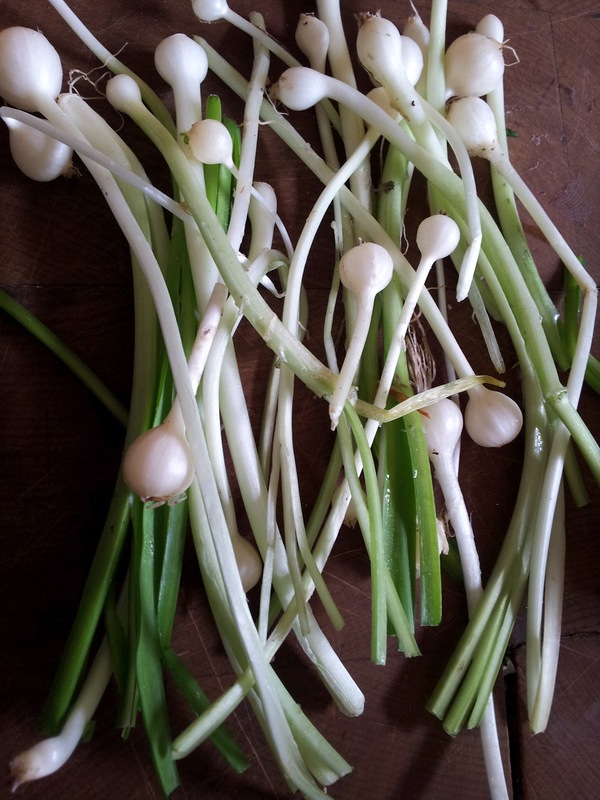 This little gem also contains vitamin A that helps the immune system , your eyes and bones. Not bad for a wild fare plant. In the US it tends to grow in woodlands and I have noticed that the leaves are much larger when they grow in the shade. 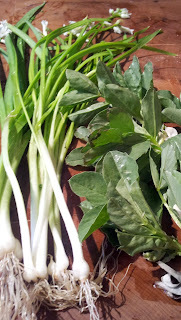 So its a plant that doesn't have to be restricted to the vegie garden.